The PF Classic/MR is one of the strains best suited for this tek. But all strains can work, some better than others. 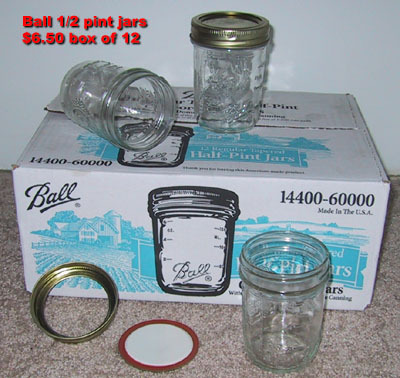 2. buy at least one dozen half-pint canning jars with lids. the half pint wide-mouth jars are the best for this method..
3. drill/punch-out 4 holes equidistant around the rim of each lid. 4. buy some brown rice and grind it into flour using a coffee grinder, blender, etc. 7. pour 1/2 cup of the verm. in medium mixing bowl and level it out. 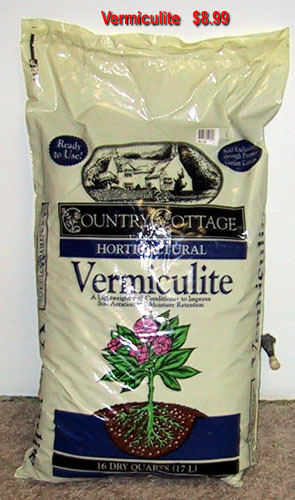 8. cover the vermiculite with 1/4 cup of the ground rice flour evenly. 9. sprinkle on 1/4 cup of spring water. 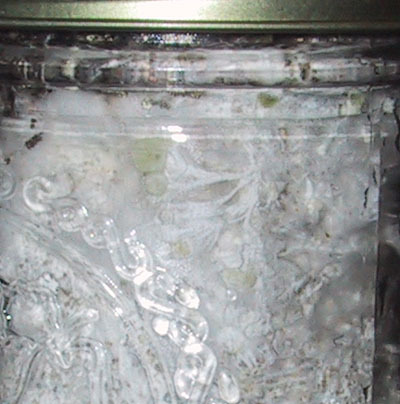 11. load mixture into a jar, until level with the bottom of the lid's threads, discarding/recycling excess. 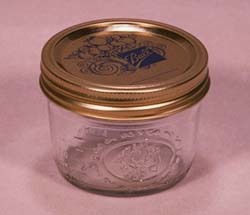 12. carefully clean the rim of jar of any material. 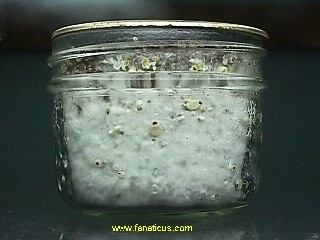 13. fill jar rest of way to rim with plain, dry vermiculite. 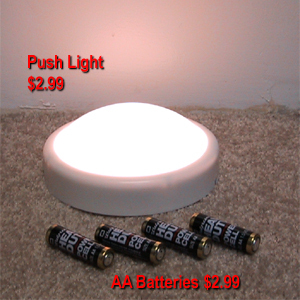 14. screw on lid, and cover holes/lid with aluminum foil. 15. repeat until you have all jars filled. 16. place jars into a large pot, add enough water to reach 1/3 up the jars' sides, cover with lid, and boil/steam 45 minutes. 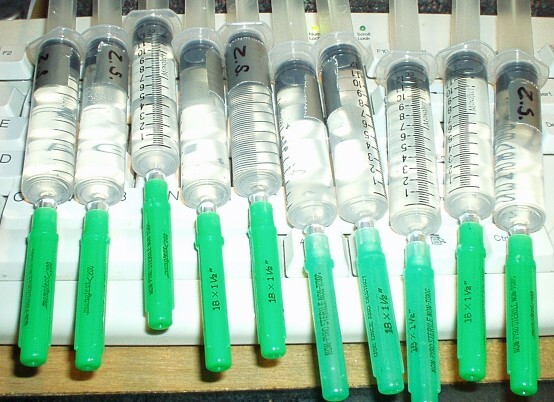 18. inject 1 cc. from the spore syringe into each jar, splitting it evenly between the 4 holes. 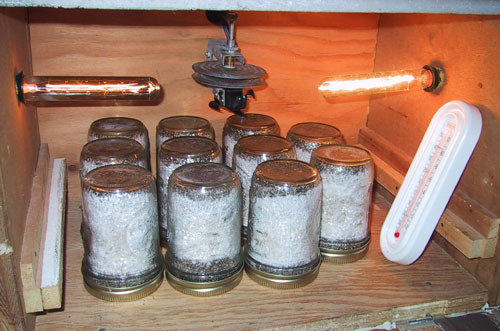 incubator or until the jar is completely covered with white growth. 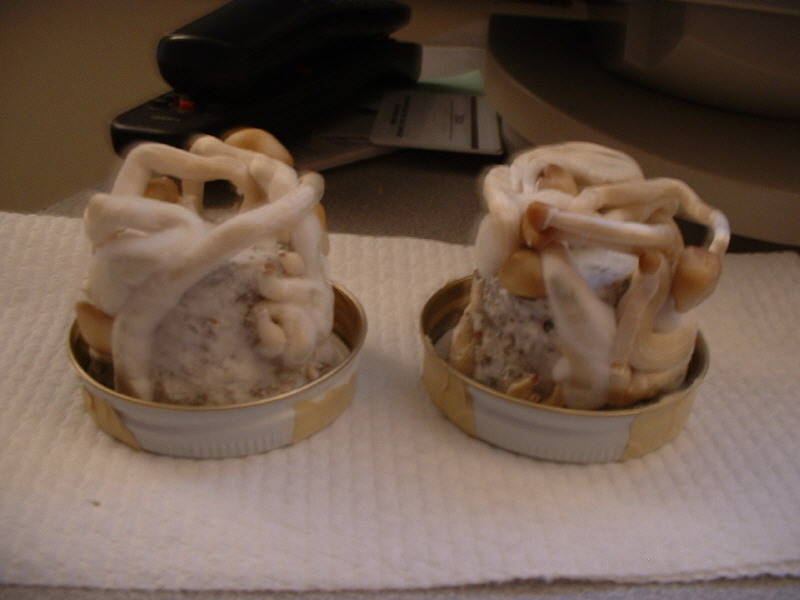 fully colonized jars meanwhile, from the very beginning if possible, expose to light several minutes a day, eventually you'll see little shroom-like growths called pins. 20. flip the jars over so the cakes rest on the lids. 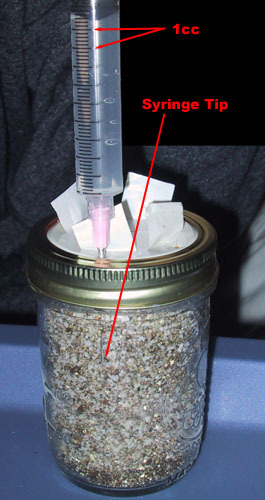 after colonization is finished and the cake is fully whitened, remove the lid, shake off the excess unattached vermiculite, shake the cake partially out to loosen it, then replace the lid. this gives more headspace for shrooms to grow and more airspace. one can repeat this process of airing the jars every few days to help speed up growth. 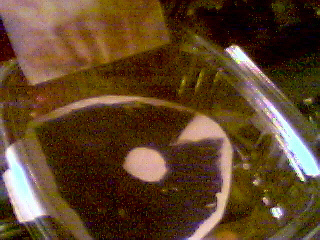 21. pick shrooms when caps open and the veil under the cap tears. or when they quit growing, or turn dark in color. 22. dry them if you want, or eat them fresh. store un-picked but ripe invitro jars in the refrigerator for freshies all-the-time, year-round. A tip to improve invitro performance: After 100% colonization....and especially when you start to see the pins form....sit them lids up, and take them off and fan over the open tops for a few minutes every few days....for gas exchange and all. Notes: This tek is primarily designed for anyone who, for whatever reason, cannot fruit in humidified terrariums. While the yield from each cake per flush is a bit less compared to some other methods, over time and multiple flushes the yield per cake can easily reach 7+ grams dry weight in mushrooms, particularly when the Dunk Tek} is used between flushes. Some few strains are rather poor performers with this method so use them at your own risk. Pf's Classic aka Amazonian aka Matias is probably one of the best for this tek. The cakes can be left unattended for long periods of time, there is no need to do anything to them in between picking sessions. You can open the jars any time after full colonization to remove the cake for picking, drying out the jar, etc. The only real concern is to be alert to any sign of decay or rot on the fruit. If it turns black or appears slimy/wet then it's best to pick ASAP.